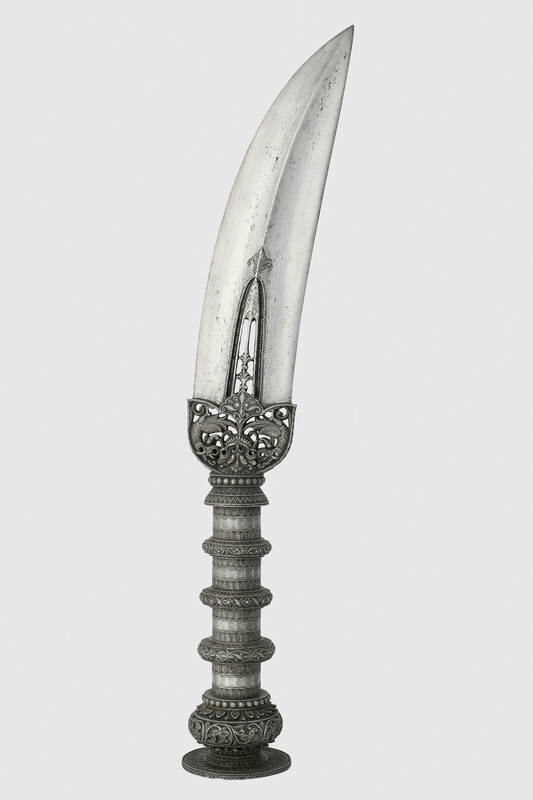 A spearhead or sang with a slightly curved steel blade that is decorated with pierced and chiselled decoration. The long tubular socket ringed by thick projecting flanges. The base of the blade has been pierced to show the heads of two makara (dragon-like mythical creatures) and a kirtimukha (face of glory) in the centre which is more pronounced when the blade faces downwards. The style of this decoration is linked with the Nayaka kingdom (1529-1736). During the rule of the Nayakas, art and architecture flourished in the region of what is now modern-day Tamil Nadu.